Photograph, caption, and commentary below by Jacqueline Banerjee, 2009. Father James Nugent (1822-1905) was another very influential Liverpudlian who was known for his good works. He was a Catholic priest who in 1849 became a curate at St Nicholas' Church, where he himself had first been baptized. Perturbed by the poverty of the large Irish immigrant population, he opened a Ragged School and later a night shelter, then a boy's refuge, a refuge for discharged women prisoners, a home for mothers and babies, and so on. He also popularised Penny Savings Banks to help his Irish poor put money aside for hard times, and strongly promoted temperance and assisted emigration. His League of the Cross for Total Abstinence, launched in 1872, spread to countries as far away as India and Australia. 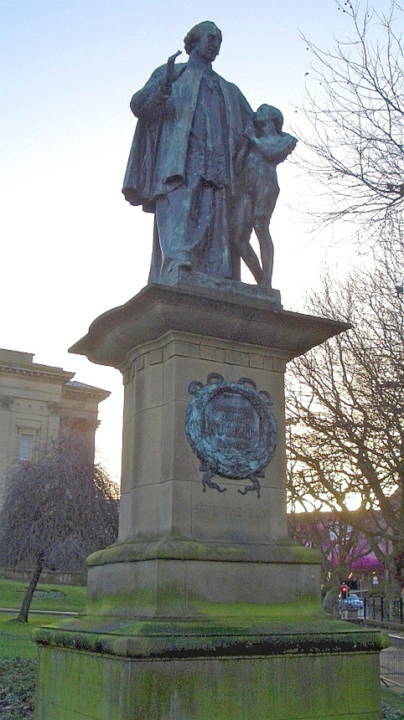 He is described on the right side of the pedestal as "the friend of all in poverty and affliction"; visible on the pedestal underneath the bronze plaque bearing his name and dates is his motto, "Save the Boy." Something of his impact can be gauged from the fact that an estimated 10,000 people came to pay their last respects to him (see Rees). The Nugent Care Society carries on his good work in Merseyside to this day (see "Father James Nugent"). Rare or even unique in its commemoration of a Catholic priest in a public place, this monument is not perhaps one of Pomeroy's strongest productions. The clerical robes make rather a solid block of Nugent himself, while the thin ragged boy being gathered in towards him, and looking up at him as to a saviour, stands awkwardly. Yet these very features contribute to the poignant effect of the composition. "Father James Nugent (1822-1905)," a Liverpool Museums site. Viewed 16 February 2009. Rees, D. Ben. "Nugent, James (1822-1905)." The Oxford Dictionary of National Biography. Online ed. Viewed 16 February 2009. Last modified 16 February 2009.